For the world’s leading opera houses, Juan Diego Flórez is very much the bel canto tenor of choice. His fluid, expressive singing and dazzling virtuosity make him ideal for the operas of Rossini, Donizetti and Bellini. His operatic and recital appearances at the most prestigious venues in the world have earned him the acclaim of critics and audiences alike. Juan Diego was born in Lima on 13 January 1973. His father, Rubén Flórez, was a singer, who specialised in performing the criollo waltzes of Peruvian composer Chabuca Granda. Juan Diego inherited both his father’s vocal talent and his love for Peruvian and Latin American music in general. His mother, María Teresa, another music-lover, gave him all the support in the world, encouraging him to persevere with his musical studies and stick to his goals. He always felt that all good musicians, including folk musicians, should read and write music. That’s why in 1990, having attended classes at various academies and taken his first singing lessons, he gained a place at Peru’s National Conservatory of Music. At this point, he had not fully made up his mind to devote himself to classical music. By the end of his first year at the conservatory, however, the experiences of those first twelve months were beginning to shape his vocation. Shortly after beginning his studies there, Juan Diego began taking singing lessons with Andrés Santa María, director of Peru’s Coro Nacional, of which he was to become a member. The Coro played a decisive part in his musical development, giving him the invaluable experience of performing music by the greatest composers at a professional level. In 1994, Juan Diego met the celebrated Peruvian tenor Ernesto Palacio in Lima, an encounter which was to prove life-changing. He offered to help the young man get started as a professional singer, and invited Juan Diego to make a recording with him at the Gerace Festival in Italy (Martín y Soler’s Il tutore burlato). Juan Diego visited Italy several more times, including a trip in 1995 to make a second recording with Palacio (Zingarelli’s Le tre ore dell’agonia). The innate characteristics of Juan Diego’s voice, qualities such as flexibility and a seemingly effortless ability to hit the high notes, destined him for the bel canto repertoire and, in particular, the operas of Rossini. Palacio realised this from the start, and guided the younger singer towards these works. In 1996, Juan Diego auditioned in Bologna for the Rossini Opera Festival in Pesaro, and was immediately cast by its Artistic Director in a small role in Ricciardo e Zoraide. He never sang this part, however, because events were about to catapult him into the firmament of the international opera world. It was summer 1996. Juan Diego was already in Pesaro, rehearsing for Ricciardo e Zoraide. Shortly before the Festival’s opening night, the tenor who was due to sing the leading role of Corradino in Matilde di Shabran had to pull out because of illness. 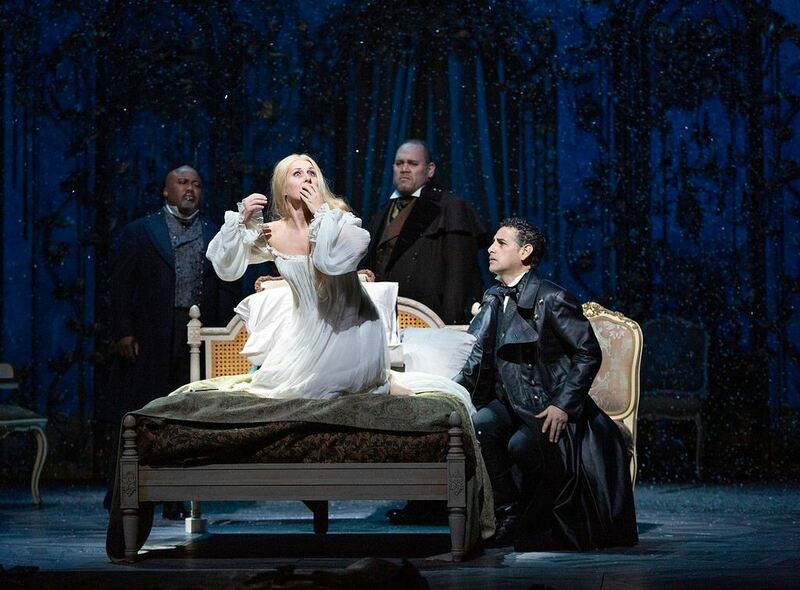 The organisers began a desperate search for a stand-in who might be up to the challenge – a less than easy task, given that this was a little-known opera, the first night was only days away, and Corradino is a very difficult role to sing. It was then that Artistic Director Luigi Ferrari offered the part to the twenty-three-year-old Juan Diego. The tenor was keen to accept on the spot but, showing admirable professionalism, asked Ferrari to give him some time over lunch to go through the score, after which he would say yes or no. He was so excited he could barely eat – after reading through just two pages, he went to Ferrari and said accepted the offer. Since then, he has appeared at all the world’s leading opera houses, concert halls and music festivals, including the Metropolitan, New York; Lyric Opera of Chicago; Los Angeles Opera; San Francisco Opera; Washington National Opera; Royal Opera House, Covent Garden; Wexford Festival; Vienna Staatsoper; Salzburg Festival; Vienna Konzerthaus; Vienna Musikverein; Paris Opéra; Radio France and Montpellier Festival; Théâtre du Capitole, Toulouse, Théâtre des Champs-Élysées, Paris; Théâtre du Châtelet, Paris; Ópera de Lyon; Teatro Real, Madrid; Teatre Liceu, Barcelona; ABAO, Bilbao; Teatro de la Maestranza, Seville; Las Palmas, Gran Canaria; Teatro São Carlos, Lisbon; La Scala, Milan; Rossini Opera Festival, Pesaro; Accademia di Santa Cecilia, Rome; Teatro San Carlo, Naples; Teatro Regio, Turin; Teatro Verdi, Trieste; Teatro Comunale, Bologna; Rome Opera; Teatro Massimo, Palermo; Teatro del Maggio Musicale Fiorentino, Florence; Teatro Carlo Felice, Genoa; Teatro Filarmonico de Verona; Munich Staatsoper; Deutsche Oper Berlin; Dresden Staatsoper; Zurich Opernhaus, etc. His repertoire includes forty-four operas: Bellini’s I Capuleti e i Montecchi, I puritani and La sonnambula; Bizet’s Les pecheurs de perles; Cimarosa’s Il Matrimonio Segreto; Donizetti’s Alahor in Granata, Don Pasquale, Elisabetta, L’elisir d’amore, La FavoriteLa Fille du régiment, Maria Stuarda, Linda di Chamounix and Lucrezia Borgia; Gluck’s Armide and Orfeo; Lehár’s Die lustige Witwe; Martín y Soler’s Il tutore burlato; Meyerbeer’s L’Étoile du nord; Mozart’s Così fan tutte, Don Giovanni and Mitridate; Paisiello’s Nina ossia la Pazza per amore; Puccini’s Gianni Schicchi; Rossini’s Adelaide de Borgogna, Ermione, Guillaume Tell, Il barbiere di Siviglia, Il signor Bruschino, Il turco in Italia, Il viaggio a Reims, La Cenerentola, La donna del lago, La gazza ladra, Le Comte Ory, L’italiana in Algeri, Matilde di Shabran, Otello, Ricciardo e Zoraide, Scala di seta, Semiramide and Zelmira; Rota’s Il cappello di paglia di Firenze; J. Strauss’s Fledermaus; and Verdi’s Falstaff and Rigoletto. In 2007, Juan Diego made history at La Scala when he broke a 70-year-old taboo and gave the first encore in the theatre since 1933, much to the audience’s delight. The aria in question was “Ah! mes amis” from Donizetti’s La Fille du régiment, renowned for its nine high Cs. He repeated the feat a few months later, in 2008, at the Met, again after a number of years in which no encores had been heard, and in 2012 at the Opéra de Paris, where no encores had been heard since its inauguration in 1989. Juan Diego has received a number of awards, including the Rossini d’Oro, the Abbiati Prize given by the Italian Association of Music Critics, the Tiberini d’Oro, the ISO de Oro, the Opera Award and the Aureliano Pertile, Bellini, Francesco Tamagno and Plácido Domingo Awards. His hobbies include football, tennis, cooking and composition. Juan Diego has written two pieces in the Peruvian genre known as the huayno. The first is the Huayno Peruano Navideño, which was performed in the Vienna Konzerthaus in 2007 by the Vienna Radio Symphony Orchestra and the Vienna Boys Choir. The second, Santo, was written for the album of the same name in 2009. Conductor Yannick Nézet-Séguin conducts a new production of Verdi's opera featuring Damrau and Juan Diego Flórez.